31 July, Kuala Lumpur – Motorcyclists are reminded to take responsibility to ensure that their motorcycles are in roadworthy condition before starting their ‘Balik Kampung’ journey home for the coming Hari Raya Aidilfitri festive holidays. 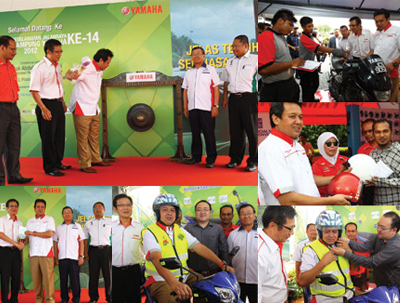 The 14th Yamaha ‘Balik Kampung’ Road Safety Campaign jointly organised by the Malaysia Motorcycle & Scooter Dealers Association (MMSDA) and Hong Leong Yamaha Motor (HLYM) is aimed at educating all motorcyclists to cultivate safe riding habits and to prioritize vehicle maintenance. The campaign, being an annual event in its 14th year running, is certainly a means in complementing the efforts of Jabatan Keselamatan Jalan Raya (JKJR) to promote road safety awareness and education. The theme for this year’s campaign is “Be Seen, Stay Safe” with message of being conspicuous can save lives. It incorporates six key elements for the motorcyclists to focus on. Firstly, avoid blind spot of other vehicles, secondly, motorcyclist has to be always visible to other road users. This is followed by functional head and tail lights to help motorcyclist stay visible at night and day plus in adverse weather condition. Next, wearing bright and reflective riding wear will definitely help riders stay visible. Riders are encouraged to always wear bright clothing and use reflective material while riding at night. Another key element is to keep a good distance from other vehicles. This is to avoid the risk for the motorcyclist not stopping in time due to emergency braking. 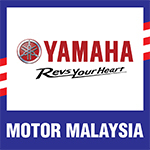 Apart from creating awareness, HLYM will conduct 15-point safety checks on all motorcycles and advise motorcyclists on the importance of periodic maintenance and carry out Yamaha Safety Riding Science demonstration (YSRS) to educate motorcyclists on safety riding skills from a scientific approach at all six locations, starting from Sungai Besi Toll Plaza, this year. To further explain the need to stay safe on the roads, FKR Tyre Manufacturer will station its technical advisors at each location to conduct checks and educate motorcyclist on tyre maintenance. In addition, 100 new SIRIM approved helmets will be given away to replace unsafe or old helmets at each location, courtesy of KHI Helmets and AEON Credit Service. Participant of 15 points maintenance check will receive a free safety vest, courtesy of P&O Insurance, and a Yamaha booklet featuring the highlights of the event & safety tips plus reflective stickers.